Earlier this year, we hosted some great little successful working lunches for wedding pros called Quick Bytes… and now that it is slower wedding season again and requested by popular demand, we are bringing them back! To kick off the late fall/winter season, we are starting with Periscope. Oh, Periscope. You came into our lives and broadcasted your goodness! The young upstart of all social media platforms. While it's new and still gaining a ton of traction and followings, it's the perfect time to take advantage of this platform! It's pretty much perfection for the wedding and event world to really show the amazing things that are happening! And we are going to go over that in two weeks! For more information and to grab a free ticket, please register for a ticket! Want to get an idea on what a Periscope broadcast looks like? Check out Tidewater and Tulle's Katch account (the quintessential place that "catches" all of your expired Periscopes!)... and of course, stay tuned to our Periscope channel as we will be doing a little 'scoping on Quick Bytes day! 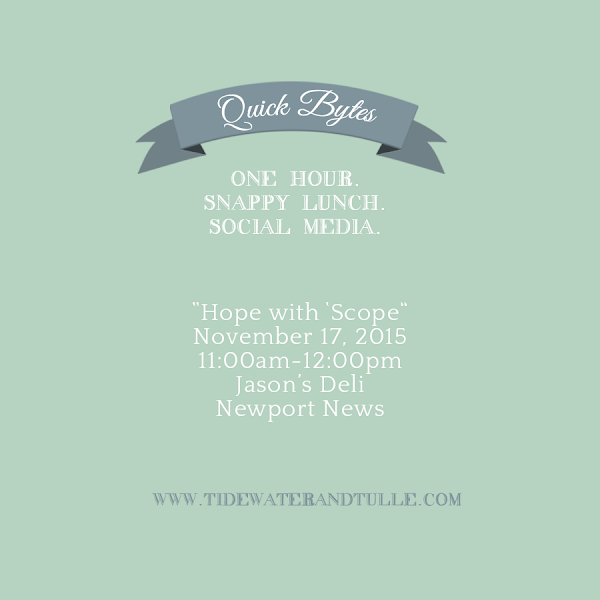 Not able to make it to Hope with 'Scope? Leave a comment below to let us know what you'd like to learn about next! See our past get-togethers right here on Tidewater and Tulle. Quick Bytes is an in-person working lunch series to help educate about the power of social media and how it relates to the wedding industry, locally and at large. Each month, we will go to different restaurants on the Southside and Peninsula. Dates, locations, and topics will vary.